Father Najeeb Michaeel shows off one of the many Christian manuscripts he saved from Iraq's Christian libraries. In an unfinished building in the northern Iraqi city of Erbil, displaced Christian children sing a little song about returning to their village. "We're going back," they sing, "to our houses, our land, our church." Right now, they're living in an open concrete structure. The self-styled Islamic State, or ISIS, took over their home village of Qaraqosh, and the Christians fled in fear, on foot. Michaeel explains that the church and various NGOs have provided shelter, heaters, pots, pans and food. But Stewart's main reason for coming from his monastery in Minnesota is a parallel rescue project, located in a secret house nearby. 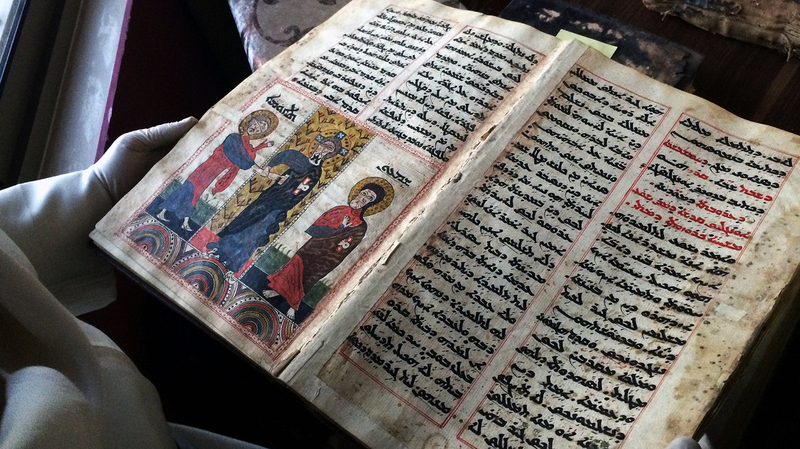 Father Najeeb Michaeel, a Iraqi Dominican monk, has been trying to further preserve Iraq's Christian texts by digitizing the ones he has been able to save. "It's a big collection of our archive, and the manuscripts there and the old books," he says proudly. "We passed three checkpoints without any problem, and I think the Virgin Mary [had] a hand to protect us," he says. Michaeel had to leave the library of more than 50,000 regular books. He knows other orders of monks have lost all their libraries, and he believes monasteries and churches have been looted and used as prisons or torture chambers by the extremists. But the manuscripts and antiquities in his care, he brought here. "The father or mother try to save the first thing — the children," he says. "So these books [are] my children." In Qaraqosh, he had been working on a digitizing project, headed by Stewart's Hill Museum & Manuscript Library in Minnesota. 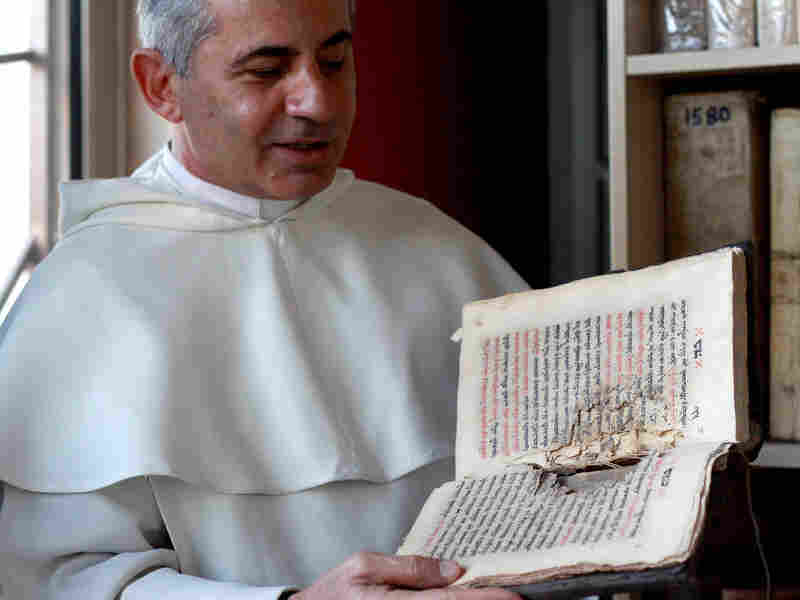 Father Michaeel had gathered manuscripts from all around Iraq and was photographing them so scholars worldwide could read them. Stewart studies manuscripts in Syriac, a variant of the Aramaic language that dates back to the time of Jesus. The monks explain there's actually two dialects: western Syriac and eastern Syriac. Michaeel sings the "Our Father" prayer in both to demonstrate the differences. Father Columba studies the way prayers shift across dialects and needs the manuscripts to do it. He's brought new equipment so the work can go on. Every night in Erbil, in drafty, half-built structures, the displaced families huddle, sing the old prayers together and hope they'll go home. In private, the monks say they think this upheaval will drive the last of Iraq's Christians out. They're trying to document as much of the heritage as they can before all this disappears.